In his latest lesson for us all, John explains goals from marks, the numbering of players and the origins of Sunday internationals. A. The Australian Dispensation Law (introduced September 1968) only restricted direct kicking to touch from inside a defender's 25. Marks claimed for a fair catch were not affected until the free-kick clause entered the Laws in 1977. Indeed, there were a few goals from marks kicked in first-class matches even in the 1970s. For example, in the France v Romania international at Béziers in December 1971 the visiting centre, Valeriu Irimescu, scored one in his side's 31-12 defeat. The following year Trevor Morris kicked one in the final New Zealand Trial before the All Blacks toured Britain, Ireland and France. The last goal from a mark in a first-class match was kicked by All Black Kit Fawcett for Waikato against Wairarapa on 10th September 1977, a couple of weeks before the end of the Southern Hemisphere season. The goals were scored from marks outside the kicker's 25. The free-kick Law arose from a long and vigorous press campaign to introduce a differential penalty for minor offences. The media argued that too many important matches in the 1950s and 1960s were decided by penalty goals kicked for minor technical offences. Under the free-kick clause, which entered the Laws in September 1977 in the Northern Hemisphere, a direct attempt to kick a goal was not allowed. That's when the mark was downgraded to a non-scoring free-kick and only permitted from inside a defender's 25. A. An excellent source for highlights old international rugby matches is the Pathe News archive available at www.britishpathe.com. The archive, which is easy to navigate, is a treasure-trove for anyone interested in the history of rugby. There are in the region of 700 rugby films covering the game from club level to Five Nations and tour Tests. All the famous matches and tries are there - Alex Obolensky's for England against New Zealand in 1936; Peter Jackson's last-minute winner for England against Australia in 1958, and Richard Sharp and Andy Hancock's efforts for England in the Calcutta Cup matches of 1963 and 1965 respectively. Nor is the coverage restricted to Twickenham. There are films from most of the Five Nations games played in Paris, Murrayfield, Cardiff, Swansea, Dublin and Belfast between 1920 and 1970. One match, labelled "rugby 1920-29", clearly shows the French and Welsh teams lining up prior to their 1920 game in Paris. There are also snippets from the France-Germany matches of the 1930s, when France were barred from the Five Nations, as well as coverage of their surprise 15-14 defeat against Romania in Bucharest in 1968 when the French were the reigning Five Nations Grand Slam champions. For Southern Hemisphere enthusiasts, all the major tours to Britain and France since the 1920s are included and of special interest to New Zealanders will be film of their win against the "Mother Country" in the final of the 1919 King's Cup tournament - the peacetime international competition featuring British and Dominion Forces sides that helped rugby get going again after the Great War. The cinema had given way to television as the prime source of news by the 1970s and for subsequent rugby coverage the BBC and, more recently ITV (for the last five World Cups) and Sky, have provided excellent broadcasts. Many of the outstanding matches have been reproduced on video and DVD. Films of matches dating back to the beginning of the 20th century are in existence. The Museum of Rugby at Twickenham has an interesting short from Leicester's match against Plymouth at Welford Road in 1901, and the earliest international coverage shows the French and English players taking the field for their 1911 match at Twickenham. Douglas Lambert, a giant of a man, scored 22 points for England that day. He can be seen third from the end as the teams file on to the field, while the last man out for England in that film is Len Haigh, the Manchester forward. Haigh is happily chatting away with the over-coated Welsh referee, Mr Johns. Many years ago there was a programme shown on Welsh television featuring the pioneering British film-maker, William Haggar. His fairground bioscope shows were a popular attraction in South Wales during Edwardian times and his film of Wales's Grand Slam win against Ireland at St Helen's, Swansea, in 1909 is possibly the earliest of a Test staged in Wales. Film of the 1905 All Blacks' tour of Britain also exists and has been edited for use in histories of New Zealand rugby. Footage includes the All Blacks' match against Glamorgan in December of 1905 and clearly shows Dave Gallaher, their captain, playing at St Helen's with its unmistakable backdrop of the old cricket pavilion. Q. When was the numbering of players altered from 1 for full-back to 15 for full-back adopted internationally? Zaal Gui-gui-nei-shvili from Georgia living in Australia. A. The New Zealand side that toured Australia in 1897 introduced the idea of enabling spectators to identify players by placing numbers on their backs. Match cards (programmes) were sold listing the players' names and their corresponding numbers, and these proved popular with the public. The numbers used on that tour were 1 to 15 (from full-back to the forwards) for New Zealand and 16 to 30 for the host teams. The Australians quickly adopted the practice. For their Tests against New Zealand (1903) and the British/Irish (1904) they numbered teams in reverse with the full-back wearing 15, as today. The All Blacks wore numbers when they made their first official tour to Britain, and for the famous Wales Test at Cardiff on December 16, 1905 both teams were numbered: 1 for full-back (Wales), but 15 for full-back (New Zealand). Even so, the practice was not particularly popular in Britain and Ireland and it was not until the 1922 Wales-England game at Cardiff that each side was numbered in a Five Nations match. It gradually caught on in the Home Unions, though many eccentric systems were adopted until the 1950s. Official programmes were usually very flimsy productions produced by the Union staging a Test, but there were often "pirate" versions issued by opportunists out to make a fast buck. The Unions deliberately chopped and changed numbering methods to outwit the pirates, and the public were warned, in the press and at grounds, that only the official programmes had the "correct numbers for players." Q. And why do the British media list teams from 15 to 9 and then 1 to 8? Zaal Gui-gui-nei-shvili from Georgia living in Australia. A. The British/Irish convention of listing teams from back to front - in soccer and hockey as well as rugby - goes back to the very beginning of international matches. The first Test played under rugby union rules was Scotland v England at Raeburn Place, Edinburgh, on March 27, 1871. The most detailed coverage of that match appeared in the next day's edition of The Scotsman. Nearly 24 inches (60 cm) of column space was given to the game and the teams were prominently displayed to show clearly the players' positions on the field. The English Twenty was listed first, with the backs preceding the forwards. The so-called "Scotch" Twenty was listed underneath in the same way. Formations varied many times in the late 1800s. Teams were reduced to fifteen-a-side for the 1877 international matches, but it was not until 1894, when all four of the Home Unions adopted the four three-quarter system, that team line-ups began to resemble today's formations. For many years teams were listed with the words full-back, three-quarters, half-backs and forwards added for clarification. Nowadays the British/Irish press assume their readers are familiar with team formations. The earliest Test cards (programmes) that are still in existence date from the Scotland v England match of 1873 at Hamilton Crescent in Glasgow. The teams were listed from back to front on that card, as indeed they were on the England v Scotland 1876 card for the match at The Oval and the Ireland v England 1875 card for the game at the Rathmines Cricket Ground in Dublin - the earliest-known programmes still in existence for English and Irish home Tests. It is probable that the media took the team lists from the match programmes. A. Sunday sport has been an institution on the Continent since the early days of the 20th century. France was the first national side to stage a full Test on a Sunday when they played the United States at Stade Colombes, Paris, on October 10, 1920. The Americans had beaten a French side - not the fully representative international team - in the 1920 Olympic Games at Antwerp a month earlier and stopped off in Paris on their way home to play a full international. France won 14-5. France's next major Sunday Test was against Cliff Porter's 1924-25 All Blacks, the Invincibles, in Toulouse on January 18, 1925. New Zealand won 30-6. Most of France's Tests with Germany, Romania and Italy from the late 1920s to the 1980s were staged on Sundays. On May 19, 1957, when France won 18-15 against Romania in Bucharest, their Sunday match was watched by 95,000 spectators - still the record attendance for any international involving France. The French were also involved in the first Sunday Test televised in Britain. Eurovision showed the second half of their 19-0 win against Australia in Paris on March 9, 1958. England's first Sunday Test was against Australia at Ballymore in Brisbane on May 29, 1988. 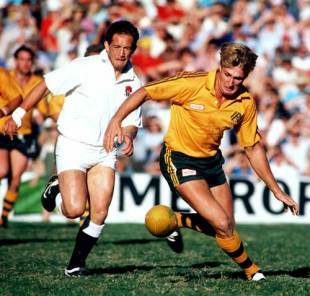 After leading 13-3, England were beaten 22-16 with Michael Lynagh landing six penalty goals for the winners. Regular Sunday Test rugby in Britain began with the 1991 World Cup. Wales's Black Sabbath came on October 6, 1991 when, at Cardiff, they were beaten 16-13 by Western Samoa, who went on to reach the quarter-finals in their first appearance in the tournament. It wasn't until March 22, 1998 that the Five Nations first staged a Sunday match, England beating Scotland 34-20 at Murrayfield. A. The last Test played under the four-point try Laws was Australia v Scotland in a Sunday match on June 21 1992 at Brisbane's Ballymore Ground. Scotland were beaten 37-13 but their captain, David Sole, had the honour of scoring the last four-point try in international rugby when he crossed near the end of the game. It was his 44th and final Test for his country.